Sunny McCormick is in love with love. She's cute, romantic and convinced her Prince Charming is out there somewhere. Grace McCarrion has never been in love. She's shy, reserved and her own worst critic. Claudia Mansour isn't sure she believes in love. She's confident, beautiful and hard to impress. They've decided to go against the grain and, rather than pledge the Greek system at the University of Illinois, create an unofficial sorority of their own. This is their story. The ups and downs, the trials and tribulations, the romance and heartbreak. As we entered the kitchen, I saw Trevor. When our eyes met he smiled, and his brown eyes widened. They were so beautiful. My heart started to thump in my chest, but I tried my best to ignore it. This was my chance and I wanted to take it. “Hey, Trevor,” I said with excitement. His words were slurred. Crap, he was trashed. And it was only ten o’clock. “Do you wanna go outside with me?” he asked as he placed his hand on my shoulder, just trying to stay upright. I eased my arm around him so he wouldn’t fall into the kitchen counter. Desperately, I glanced at my friends for help. My face probably looked pained; I was sure my forehead was creased with worry. We hadn’t planned for this scenario. They looked somewhat concerned, but Sunny gave me a look urging me to go with him. He gave me the widest grin and it made me feel a little better. Claudia quickly slipped a beer into my free hand and smiled at us as we walked onto the balcony. “I’m so glad you came tonight,” Trevor said with a goofy smile. “Really?” I was stunned. All this working up to telling him how I felt, and he already felt the same way? “Hell, yeah,” he said, rubbing the back of his neck. “I got here early, just so I wouldn’t miss you.” He put his hands on the railing to stabilize himself, while keeping his eyes on me. Well, that explained why Trevor was so drunk already. At least I didn’t have to Google A.A. when I got back to the dorms. Strangely enough, my neck wasn’t sweating. My pulse was starting to even out, and there was no sign of a panic attack on the horizon. Maybe this dating business wasn’t so difficult. Maybe it just took a few cocktails to help everyone loosen up. Maybe I could like a guy, maybe I could relax enough to actually date. As I opened my mouth to respond, Trevor doubled over, clutching his stomach. I screamed as he fell to the floor. He grasped my legs tightly as he heaved and vomited, right onto my brand new ballet flats. Bouquet Toss,Champagne Toast and Unwanted stars are available in ebook on all platforms and paperback via Amazon and Barnes & Noble. 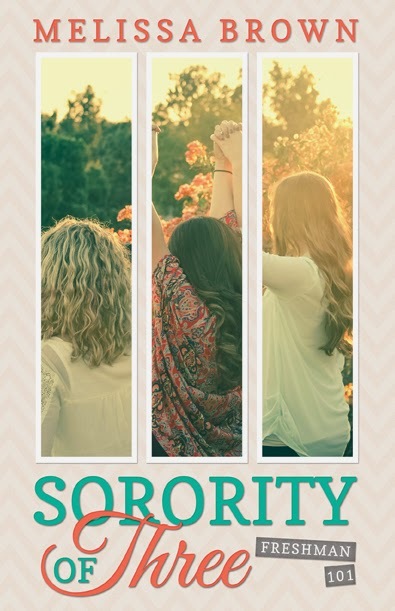 A new series called "Sorority of Three" is also coming in spring of 2014! Sorority of Three:Freshman 101 will be available April 6th.